Hi, all! Please find below a regular development status report, this one covering the period from Mar 18 to Mar 31, 2019. Within this timeframe, we were strongly focused on getting The Abyss Minimum Viable Product (MVP) prepared for a successful launch on time, without delays, and running a series of final tests to make sure the system works perfectly well and you will enjoy it. We reported the major part of our recent updates and developments on Friday, however, today we’ll share some other points. To sum things up, our goal was to get out there with quality, scalable and nice looking MVP with a starting set of features and games. We did put a reasonable effort into making The Abyss platform responsive and functional in web/mobile browsers and on various supportable devices. We have spent countless days building the innovative and complex software solution that will allow real-time playing video games and leveraging the extraordinary capabilities of the blockchain technology allowing to utilize ABYSS tokens for purchases. We do feel that we have delivered the most brilliant basic proof of The Abyss concept and we also warmly invite you to try out the MVP for yourself. The MVP is done. What comes next, you may ask? We’re currently busy building (finalizing actually) a dedicated desktop app that will allow installing and playing client games. As for now, we have successfully completed the functionality for client games installation and update. The “Download->Install->Update->Install->Play Game” scheme undergoes testing and stabilization processes. The technology basis for client games integration is also complete, and the process runs well. Desktop client updates are based on a unified Build Distribution System. The desktop client will be rolled out very soon. Aside from releasing the desktop app, our current list of short-term plans (in terms of development) includes bug hunting, introducing more UI/UX improvements, developing and adding new features, integrating more games. Further development process will come along with marketing and PR support. 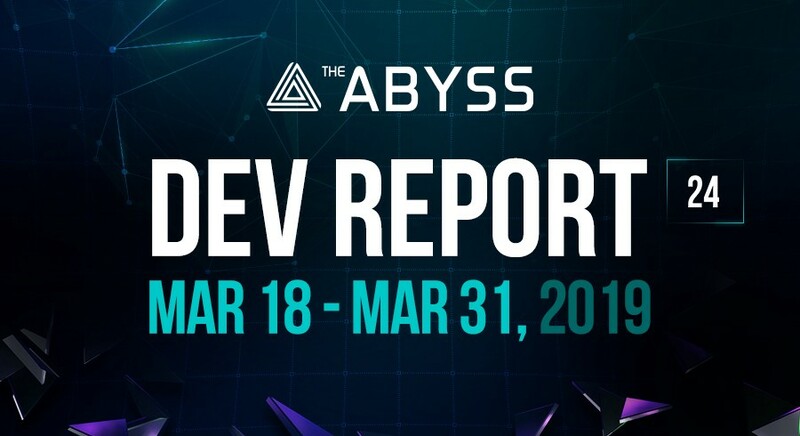 In the near future, we will start testing The Abyss user acquisition in several regional markets. As a result, we will get tested conversion rates we need to go further. Next step will be running an image ads campaign that will be focused on community-based media across the MMO games universe. Next, we will move to Tier 1 markets. Well, that’s it for today. The Abyss Team is working hard to deliver a desktop client and games integration. And we will keep you up to date with the development process twice per month, as previously. The next report is scheduled for April 15, 2019.